Sleep training clock? What? A bit of back-story might be needed. We were sailing along smoothly with our nighttime routine. Our 2-1/2-year-old would sleep perfectly through the night (except for a couple bumps in the road here and there) and we were back to sleeping soundly ourselves. And then one day, out of nowhere, a new trend emerged. Our little toddler would get up at 5am and wouldn’t go back to sleep unless it was in our bed. Then the next night it was 4am. Then 3am the next time. Needless to say, this new pattern meant it was time for some good ol’ fashioned toddler sleep training. 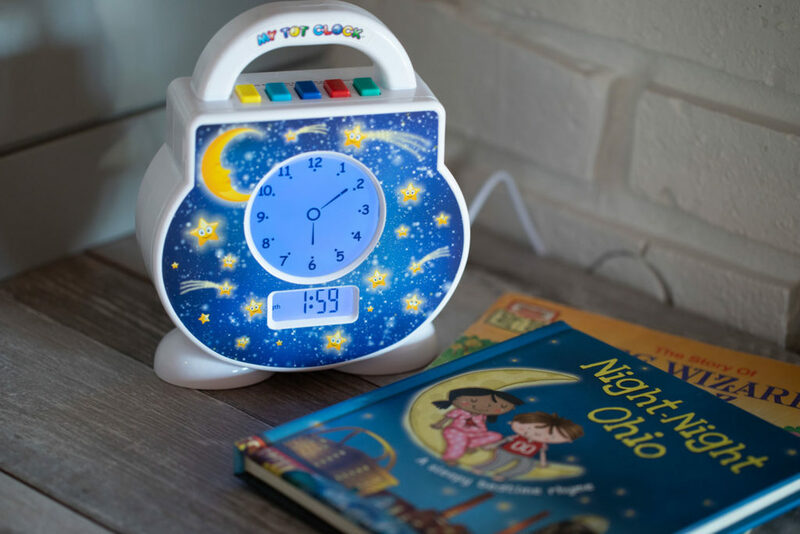 We’d heard that people use a sleep training clock to get toddlers to stay in bed because they are kind of at that perfect age where they can understand what colors and sounds mean, and you can explain it to them in a way they can understand it. We decided to start there, but to be perfectly honest, we didn’t have high hopes at all. It sounded a little too good to be true that our toddler (who like most her age, doesn’t have the best listening skills) would really listen and follow direction from a clock. So if you’re unfamiliar with the concept of a toddler sleep training clock, let me break it down for you. What is a sleep training clock? Well, they come in all shapes and sizes (and prices), but the one we went with was the My Tot Clock. Most sleep training clocks work in the same general way. You set your own hours – we chose 7:45pm as bedtime and 7:00am as her wake-up time. But the cool thing is, you can also customize different hours for the weekend. When it’s bedtime, the clock will change to a bedtime color (ours is blue). And when it’s time to wake up, the clock will change to a wake-up color (ours is yellow). It also plays a song when it’s time to wake up, but you can turn off that functionality if you don’t want to use it. It’s really that simple. The premise being that your kiddo stays in bed when the bedtime color is on and can get up anytime the wake up color is on. Ours also has an actual clock on it for when she’s older and can tell time. Do sleep training clocks actually work? Like I said, we didn’t have super high hopes. We figured it was worth a try, but come on, toddlers aren’t known for their ability to follow direction. To our surprise though, it was a big hit. Luckily, we had just gone through the whole drill of what the lights on a stop light mean while driving. So we had a solid base to work with (teach this to your kids now if you haven’t already because it will help if you try to use a sleep training clock). We introduced the clock and she was enamored with it. She understood right away what the colors meant and she started following its direction from the very first night we put it in her room. It’s been about two weeks and she’s still going strong with her sleep/wake patterns according to what we set on the clock. She’ll even go into her room and see that it’s blue and come out saying “Oh man” when she realizes it’s bed time. Random sidenote: this clock also applies to nap time. You can set a different color for naps, or just stick with blue. 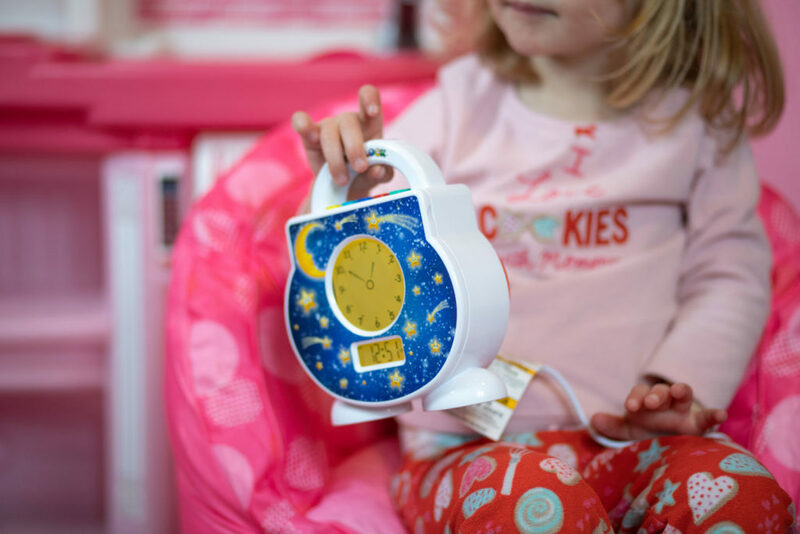 Which toddler sleep training clock did we use? There are 5 levels of illumination so it doubles as a night light! 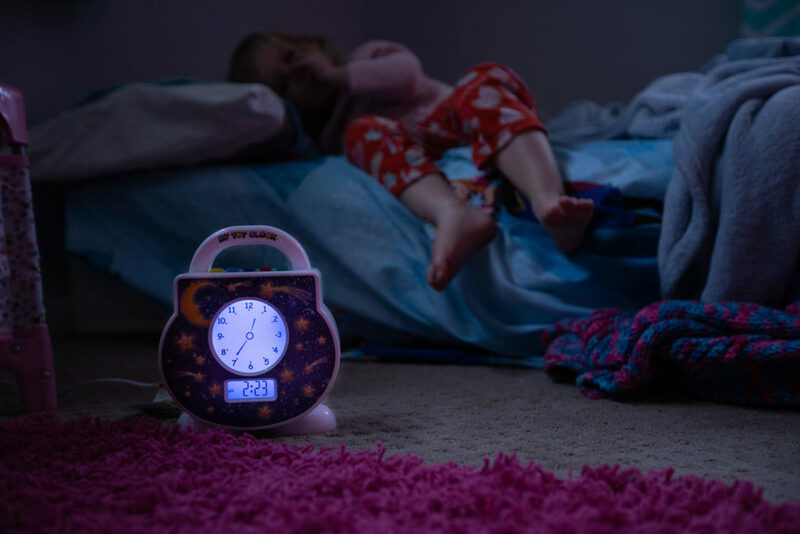 So if you can’t tell – we’re now on the toddler sleep clock bandwagon. The one asterisk we would include is that we’ve been using the clock for two weeks, so it’s TBD if it will continue to work. We can say it doesn’t seem to be losing any steam and she’s continuing to follow the colors. I would suggest making sure you don’t deviate from the process. If you start to get lenient with following the lights, its effectiveness may wear off. This also might not be something that works for everyone, but it’s a really easy and affordable strategy to try because if it does work, it may get you back into the routine faster than some of the other methods. We were very skeptical at first too, but would hands down recommend giving it a whirl. What do you have to lose? 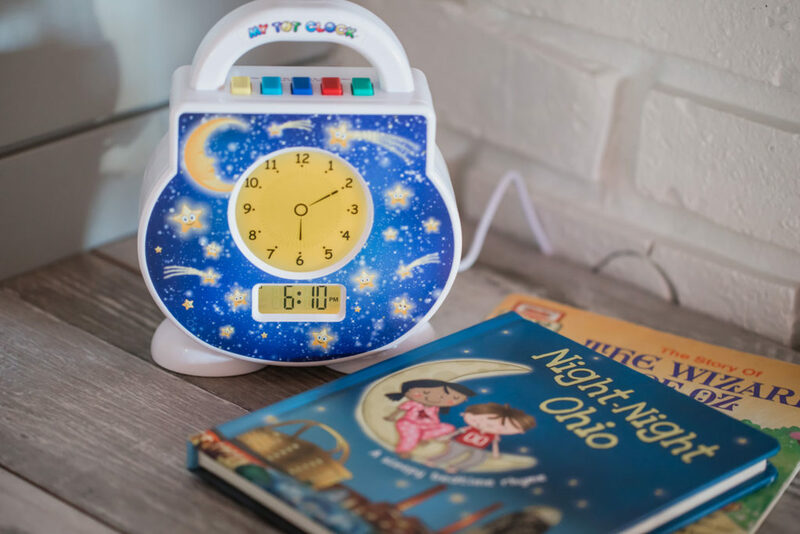 Let us know if you have any questions for us on how we use our clock or how we introduced it to our little one.